Toshiba Installs First Vantage Titan 3T in US – Canon Medical Research USA, Inc. Toshiba Installs First Vantage Titan 3T in US – Canon Medical Research USA, Inc.
Steinberg Diagnostic Medical Imaging Center (SDMI) in Las Vegas needed an MR system to perform a range of patient exams at a high-volume imaging center. To solve this issue, it recently installed the first Vantage Titan™ 3T in the U.S. from Toshiba America Medical Systems, Inc. With the Vantage Titan 3T's multi-port transmission technology and quiet gradients, physicians can perform artifact-free body imaging with ease, for improved patient comfort and outcomes. "Toshiba's Vantage Titan 3T is truly the first patient-friendly 3T on the market," said Dr. Mark Winkler, professor of health sciences at the University of Nevada, Las Vegas and founding partner of SDMI. "We use this robust, all purpose scanner for a variety of exams." By making 3T MR exams more comfortable, hospitals and imaging centers can greatly improve patient compliance, exam efficiency and productivity. The Vantage Titan 3T's open bore offers a 71 cm aperture and features Toshiba's exclusive PianissimoTM noise-reduction technology, which reduces exam noise by up to 33 dB(A), making the Vantage Titan 3T MR the quietest available. The system is also equipped with multi-port transmission, an advanced radio frequency transmission technology for artifact-free body imaging. 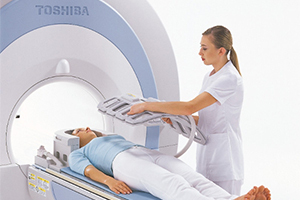 "We designed the Vantage Titan 3T MR with our customers in mind, addressing the need for a patient-friendly system," said Stuart Clarkson, director, MR Business Unit, Toshiba. "Providing clinicians with a diagnostic imaging tool that produces clear images for any exam type not only helps hospitals increase workflow and productivity, but improves diagnostic confidence for better treatment planning."